Bosch sent me out their Cordless PS50 Multi-X a few months back, as well as their Corded MX25E Multi-X. Since I got them both around the same time, and have used them both on the jobsite, I figured it would be best to do a single article that reviews and compares both models together. Oddly, Bosch's introduction into the oscillation tool market was done with the 10.8/12-volt cordless PS50, while other manufacturers and even their own tool subsidiary, Dremel, all introduced corded models. But even though the PS50 is a few years old, it is still a very relevant tool today. As long as you look at the PS50 as a cordless tool and purchase it knowing it will have its limitations compared to corded models, you quickly realize what a great tool it is. As a cordless tool (especially a 10.8-volt tool), you might expect the PS50 to be lacking in power, and compared to a corded model it is, but it is still powerful enough to do the tasks you expect from an oscillating tool. Basic cutting and sanding tasks are no problem; the real issue with the PS50 is its battery life. Depending on the task at hand, you are looking at between 5-10 minutes of runtime. With times this short you are somewhat limited to what it can accomplish, but this tool shines in other areas. As with all cordless tools, it is all about portability and the convenience that goes with being free from cords. Being able to jump on a ladder and go, without having to pull out an extension cord is a huge plus. Having two or more batteries does extend your overall run time, but this will require you to quickly charge your batteries as they die. What we really need are batteries with more amp hours. I used the PS50 on the job in an area where there were no outlets nearby. I had one little cut to make on 3/4"x1" MDF, that was up against a wall. The only way to cut this piece of material was to use an oscillation tool, and the cordless PS50 came to the rescue. Pulling out and running extension cords would have taken longer than the cutting task itself. The PS50 is powerful enough for most tasks, but the corded MX25E does have a bit more torque; as you might expect. Because of this, the PS50 can quickly lose its charge if it is pushed too hard. The simple solution to this is to let the blade of the tool do the work and make sure you are at the correct oscillation speed. 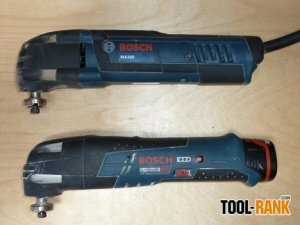 Design wise, both Bosch models are similar but very different. The cordless PS50 is a little longer than the MX25E, and it is also a bit narrower. Despite the similar size, the MX25E is noticeably heavier. Both models feel very solid in hand and are balanced pretty well, with the weight slightly favoring the cutting end of the tools. Both Models offer variable speed oscillation speeds that go up to 20,000 OPM, but the cordless model's 5,000 OPM at the low end beats the 8,000 OPM of the MX25E. The most noticeable design difference is the location of the variable speed dial. The dial on the PS50 is easily accessible on the side of the tool, next to a battery fuel gauge, but because of its position, it could accidentally get changed during operation. The MX25E has its dial placed just under the power cord at the back of the tool. It is not as convenient to get to, but you don't have to worry about bumping it. One of the biggest advantages Bosch has over the major brands is their use of the OIS oscillation accessory standard. This is a standard that Bosch has developed to ensure that brands that use OIS can share accessories with other brands. As more brands adopt the OIS standard, the easier it will be to find accessories, and the more accessories options we will have. Just like you can go into any hardware store and find a T-shank jigsaw blade or SDS drill bit. Even now, because of the large presence of Bosch, their accessories are easy to find in hardware stores. Is the MX25E the best-corded oscillation tool on the market today? Having never used the Fein tools, I can not say. But, I do believe the MX25E offers the best value. Power wise, the MX25E has an edge over Fein, but when it comes to oscillating angle, Fein has the edge. In my mind power beats out oscillating degrees in importance, but in actuality, I have no clue as to which is more important. I would say the biggest disadvantage both Bosch tools have vs Fein, is the tool-less blade change feature that Fein has. Bosch Germany has shown this feature on new German models, but when or if this feature comes to the USA is still unknown. Depending on the kit you buy, your Multi-X will either come in a soft storage bag, or a Hard Plastic carrying case, the PS50 also has a L-Boxx case option. Both models I received came with the regular hard plastic case, and I have found that both cases work very well. Though I will admit that I usually ditch the case and just carry the tools in my other tool bags. Also included is a nice storage box for your accessories. The box has slots and places for all of your blades and sanding pads, and really is a good place to store your accessories. The photo of the accessories above is there to show the available accessory options from Bosch. Actual Multi-X kits only come with a couple of blades and sanding pads, depending on which kit you get. Bosch also has more accessories than what I have pictured. One thing people always seem to discovery when using oscillating tools is that they get used on far more projects than you would have ever expected. This is something that I realized myself, and something my co-workers also discovered. Another thing I discovered while being privileged enough to use both models, is that they really are as handy as the infomercials make them out to be. They might not be the best tool for cutting over large distances, like a circular saw, but they are the best plunge cutting tool option. The Multi-X is now my go-to tool for electrical cutouts in drywall and 1/4" cabinet backs. At around $140 for the corded MX25E, you really can't go wrong. The cordless PS50 is more expensive at $170 and comes with two batteries and a charger. If you can catch them on sale, like Bosch had them at my local tool store, you can get a great deal and just might want to buy both. Or if you have a co-worker, you can each get a different model and share. This is what we do with my co-workers. One of us carries the cordless version for portability, and another the corded for when we have many cuts to make.